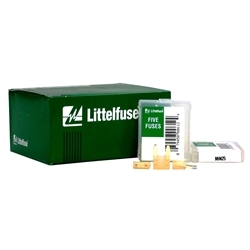 Littelfuse Mini 25 25amp Blade Fuse Box of 100. Patented and introduced in 1989 by Littelfuse to meet the OEM need to protect a greater number of circuits without utilizing more space. Features silver plated blades and Littelfuse designed industry standard color coding to indicate amp rating.